100 Things Duke Fans Should Know & Do Before They Die (100 Things...Fans Should Know) est le grand livre que vous voulez. Ce beau livre est créé par Johnny Moore. En fait, le livre a 288 pages. The 100 Things Duke Fans Should Know & Do Before They Die (100 Things...Fans Should Know) est libéré par la fabrication de Triumph Books. Vous pouvez consulter en ligne avec 100 Things Duke Fans Should Know & Do Before They Die (100 Things...Fans Should Know) étape facile. Toutefois, si vous désirez garder pour ordinateur portable, vous pouvez 100 Things Duke Fans Should Know & Do Before They Die (100 Things...Fans Should Know) sauver maintenant. 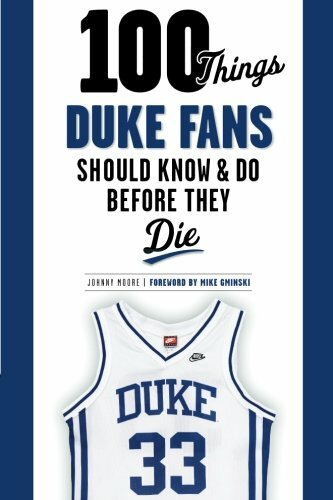 100 Things Duke Fans Should Know & Do Before They Die is the ultimate resource guide for true fans of the Blue Devils. Whether you're a die-hard booster from the days of Mike Gminski or a new supporter of Jahlil Okafor, these are the 100 things all fans need to know and do in their lifetime. It lists figures from the Vic Bubas era to the current Coach K era—with stories on each of his four national championships and the players involved. The book also features the places all Duke fans needs to visit, such as the Angus Barn, and provides background on the university, including how it was founded and what makes the famed chapel such a special structure. Every essential piece of Blue Devils knowledge and trivia is here, as well as must-do activities, all ranked from 1 to 100, providing an entertaining and easy-to-follow checklist as you progress on your way to fan superstardom.